Booth: You're not always, like, this mean person. 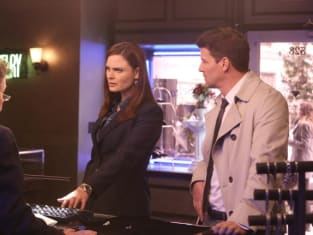 Bones: Because if I were you would leave me for a nicer person. Booth: I'm not gonna leave you for a nice person because you are a nice person. Bones: I thought you enjoyed the limelight, Dr. Edison. Clark: I was wrong. I like the pure science. No distractions. [to Angela] I hate smart criminals. Permalink: I hate smart criminals. Bones: Do you think Dr. Edison is more likable than I am? Cam: Oh, likability is subjective. [to jeweler] We have a deal that he will never ask me to marry him. And when the time comes to marry, which I do not foresee, he believes that I will ask him. Booth: Bones? Are you here to buy me an engagement ring? Permalink: Bones? Are you here to buy me an engagement ring? Uh, no.